The 19.1-m (62-ft, 6-in.) 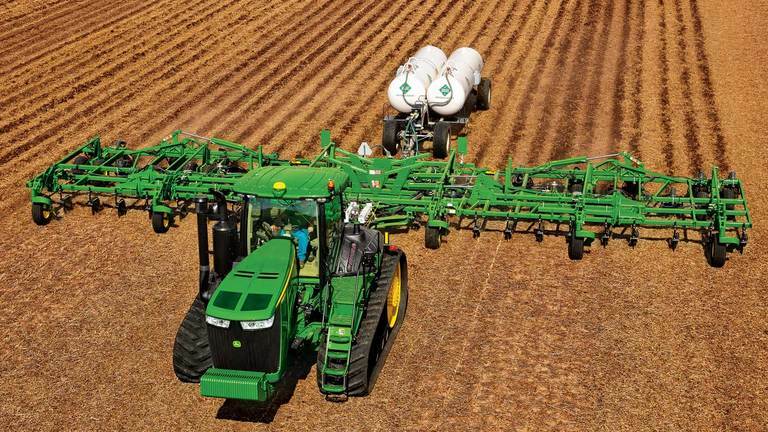 2410C Nutrient Applicator delivers a 47 percent increase in productivity over the largest 13.0-m (42-ft, 6 in.) John Deere 2510C Conventional Applicator. The five individual frame sections can be adjusted independently of each other. 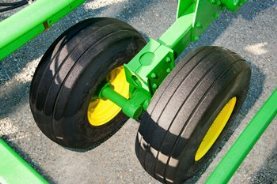 The operator can tailor the depth setting of individual sections to ensure proper product sealing and fertilizer placement even in compressed wheel track areas and varying field conditions. The Tru-Depth™ heavy-duty cast standards on the 2410C Nutrient Applicators are designed for precise and accurate nutrient placement and offer 567 kg (1250 lb) of trip force to allow for faster operating speeds. The conventional standard comes as base equipment and the parabolic chisel standard is available as an option. The Tru-Depth conventional heavy-duty cast standard allows for application from 100 mm (4 in.) to 250 mm (10 in.) deep. With a trip height of 279 mm (11 in. 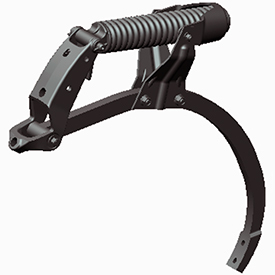 ), the standard is able to handle field obstacles and reset back to the operating depth with no shear bolt replacement. This reduces downtime spent replacing shear bolts which leads to increased productivity. The Tru-Depth heavy-duty cast chisel standard allows operators to perform tillage up to 305 mm (12 in.) 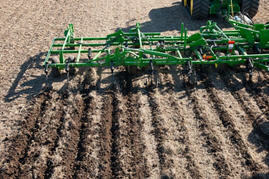 deep and gives them the ability to perform nutrient application and tillage in one pass. The standard is designed to mix and bury residue to promote decomposition and encourage faster soil warming. The closing disk system is standard equipment on the conventional models and is not available on the chisel models. 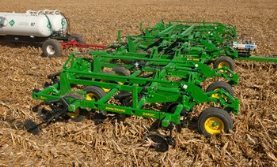 As the nutrient knife places anhydrous, closing disks reduce soil disturbance while bringing the soil back for proper sealing. Soil types, moisture, and residue levels can greatly affect the amount and consistency of the soil that is brought back in. The closing disks on the 2410C can be adjusted from a narrow setting of 220 mm (8.8 in.) apart to the widest setting of 430 mm (17 in.) apart for industry leading adjustability. The 460-mm (18-in.) 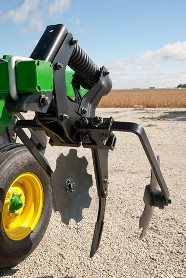 concave notched blades close the slot and seal the anhydrous in the soil. 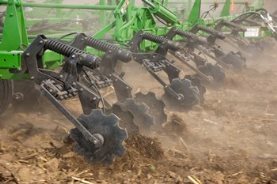 The closing disks are designed with down-pressure springs built in, which limits bounce in rough field conditions. The closing arms have been engineered to flex as large obstructions (clods/rocks/etc.) flow between the knife and the blade. Independent up and down travel arms are key to the nearly plug-free closing disk. This allows one machine to operate in any soil type and eliminates the need to have multiple disk sealer attachments along with labor required to change them out. 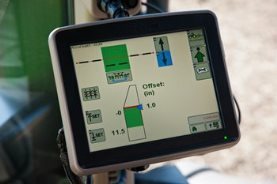 The four-rank frame design of the 2410C has provided unmatched reliability to John Deere operators for over 10 years and a countless amount of acres. 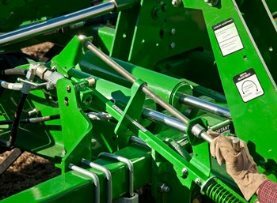 With operators requiring faster working speeds out of larger implements, machines require thicker frame tubes, additional diagonal bracing, and frame gussets to endure 600 engine horsepower tractors. The frame stretches 3.40 m (134 in.) front-to-back, which allows for high levels of residue to easily flow through the staggered row units ensuring higher productivity and consistent nutrient placement. 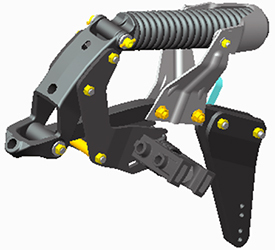 The large frame member sizes, tube-through-tube construction, and wheel module placement adds to the structural integrity, providing a stable front-to-rear and side-to-side operation. The ease of accessibility to the maintenance points of the machine is achieved through 1.1 m (44 in.) of underframe clearance. This enables the operator to save valuable time while experiencing less fatigue for routine maintenance and service. 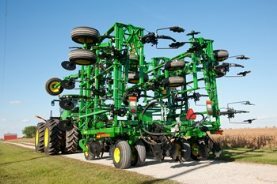 The wheel configuration of the 2410C provides increased performance with a total of 18 front castering and Walk-Over™ tandem wheels. This allows for excellent depth accuracy for following the contour of the terrain and provides greater flotation and maneuverability. The front castering wheels provide good stability at the front of the machine and facilitate excellent turning, reducing tire scuffing. The rear-mounted walking tandem wheels maintain a level frame for increased operating speeds over rough fields .